Hey, I’ve been having a rough time lately. I’m aware I have not been posting much. I finally made an original recipe to share with you all. I came up with this idea for Thanksgiving because it’s easy to transport for a long car ride, easy to reheat, and has a little bit of everything. Also, since I cannot eat the vegan Thanksgiving roasts like Tofurky and such because they’re made out of pure gluten, I figured this would be even more delicious and satisfying for me. This recipe contains butternut squash, kale, walnuts, caramelized onions, and vegan ricotta, as well as gluten-free lasagna noodles. It uses two packages of Kite Hill ricotta, which is a pretty big splurge but so worth it if you can get it. If you can’t, it works with some firm tofu, or you can make a cashew ricotta too. Place butternut squash in a large saucepan and cover with water. When water is boiling, set a timer for 15-20 minutes. Remove from heat when the squash is soft. While the butternut squash is boiling, prepare the caramelized onions. Place 2 tablespoons olive oil in a large frying pan with a cover. Toss the onions in the oil. Keep on medium heat (you may have to lower it later) for 10-15 minutes, stirring every so often. When browned, add in the brown sugar, stir, and remove from heat. Set aside for assembly of the lasagna later. When the squash is cooked, drain the water and place back into the pot. Mash the squash with a potato masher until smooth. Stir in the vegetable broth, salt and pepper, nutmeg, garlic, and nutritional yeast. Prepare the kale by boiling three cups of water in a large covered pot. When boiling, add the kale and cover. Stir every so often until all the kale is wilted, for about 5 minutes. Prepare the walnuts by placing them in a food processor and blend until pasty. If you like, you can add some additional seasonings to the walnuts before blending. Prepare the lasagna noodles according to the packaged directions and preheat the oven to 350 degrees F.
Combine the ricotta with the nondairy milk in a medium sized bowl. Drizzle the remaining two tablespoons of olive oil onto a large casserole or lasagna pan. Place a layer of noodles on the bottom, followed by half the butternut sauce, half the ricotta, half the walnuts, and all of the kale. Repeat in the same order except this time, place on top with the onions instead of the kale for the second layer. Allow it to cool slightly before digging in. I hope you have a lot to be grateful for! Just a quick post to share my menu I have planned out for Christmas. I hope to post a bit more later on in the week. I’m so excited for all this! haha. Yum. So I already posted this, but I’ll post it again in case you missed it because it’s relevant. I’ve been making food to share with my classmates at my college program as a part of my project I’m working on. Recently, they wrote about me in their “student snapshots” and actually took pictures of me unveiling this dish I’m about to post the recipe to now. It was a big hit. Take a look. This is the type of brunch dish that is so good it amazes people. It’s also the type of dish where when you eat it you are gasping a bit. I literally said “Omm nom” when I first tried it, I think. It was so good that no one who wasn’t vegan even cared that it was vegan. I’m sorry for bragging, but honestly I was actually a bit shocked at first at how good this thing I invented came out. It has a lot going on, but trust me, it’s so good. It’s a bit of a pain if you need to make the pretzels just to make this dish, but if you want pretzels too, then it’s a great decision. Just reserve at least 2 days before you plan on having this. My family has a tradition for certain holidays to make the most luxurious, elaborate, and fancy brunch recipes for certain holidays like Christmas morning and such, and this is definitely already on the menu for that! Break up pretzels into small chunks and place in a large mixing bowl. Pour almond milk over this mixture and coat well. Let sit in the fridge overnight. The next day, preheat the oven to 350 degrees F.
In a medium sized bowl, mix the chia seeds, arrowroot, water, sugars, vanilla, and spices together. 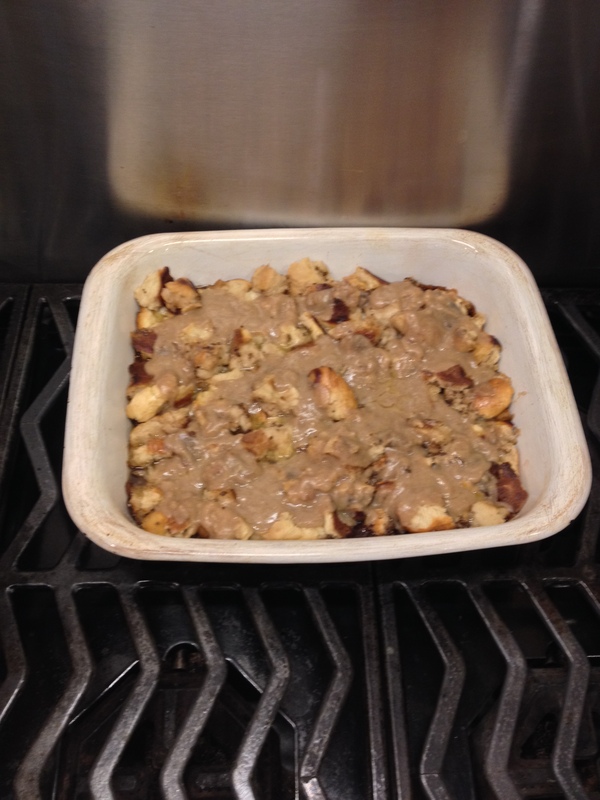 Place the pretzel mixture into a casserole dish, and fold in the mixture you just prepared in the medium bowl. Take out of the oven and drizzle both the date caramel and melted margarine over the bread pudding. Hello everyone! I’m very excited today because I just got put up on my college program’s website about the work I’m doing. They interviewed me and I talked about my blog and my future plans of incorporating a vegan project into my education plan. You can view that article here! Anyways, on to the food! 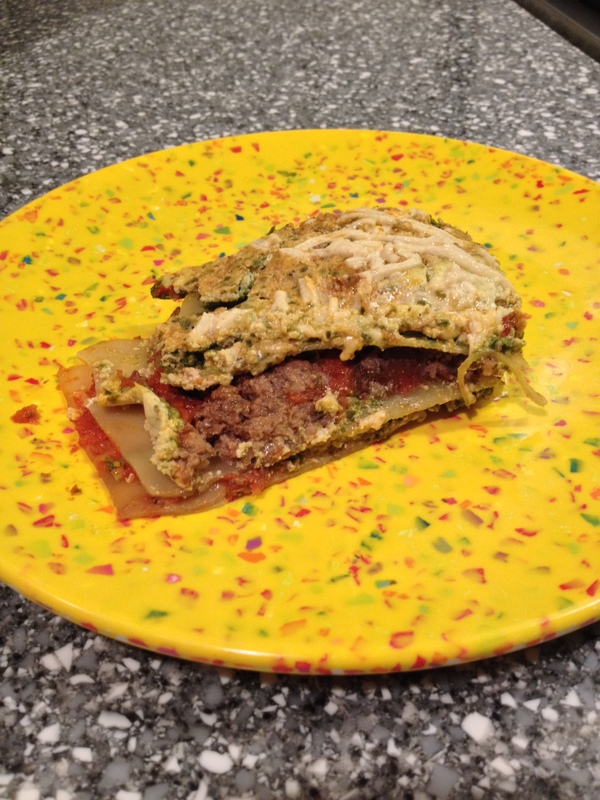 This lasagna is quite rich with the walnut meat, and has tons of protein due to the tofu ricotta, and a healthy dose of greens due to the pesto (with basil and parsley!). This walnut meat here is very similar to my earlier recipe but changed slightly to change the flavor from a hamburger style to a more italian style. The tofu ricotta is also quite similar to the one for the pizza recipe I posted earlier on Sept. 12, but I changed it again because there is a separate basil factor with the pesto, so extra basil in the ricotta was not necessary. Prepare the walnut meat. Place walnuts, onion, garlic and portobello into a food processor and blend until everything melds together but remains chunky. 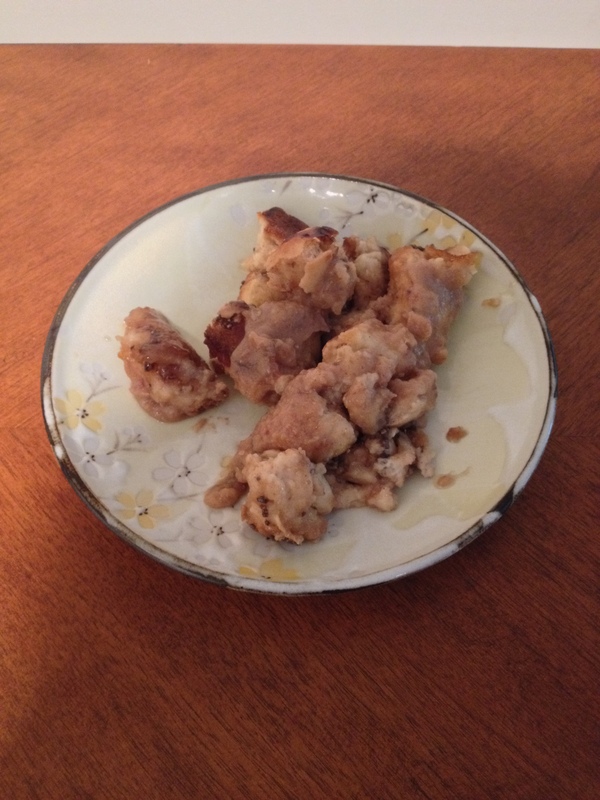 Place this mushy walnut meat into a bowl, and fold in the remaining ingredients. On a parchment lined baking sheet, pat down the “meat” into a thin layer with a spatula. Bake 15 minutes. Take out of the oven and with a spatula, scrape up the “meat” and flip it. Bake for 15 more minutes and set aside. Prepare the pesto. 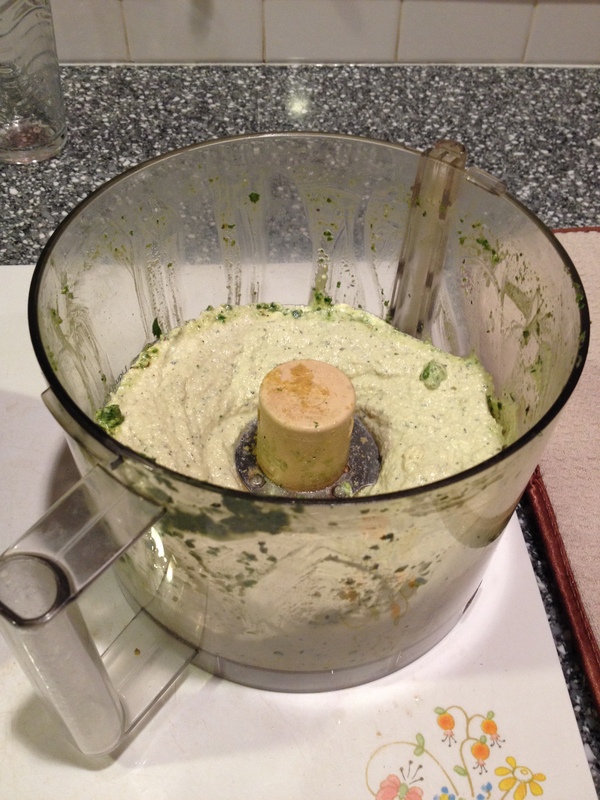 First place the basil, parsley, and garlic and chop in the food processor until finely ground. Add the pine nuts and olive oil into the mix, and blend. You will need to scrape down the sides with a rubber spatula to ensure that everything gets properly mixed together and to get a good consistency. 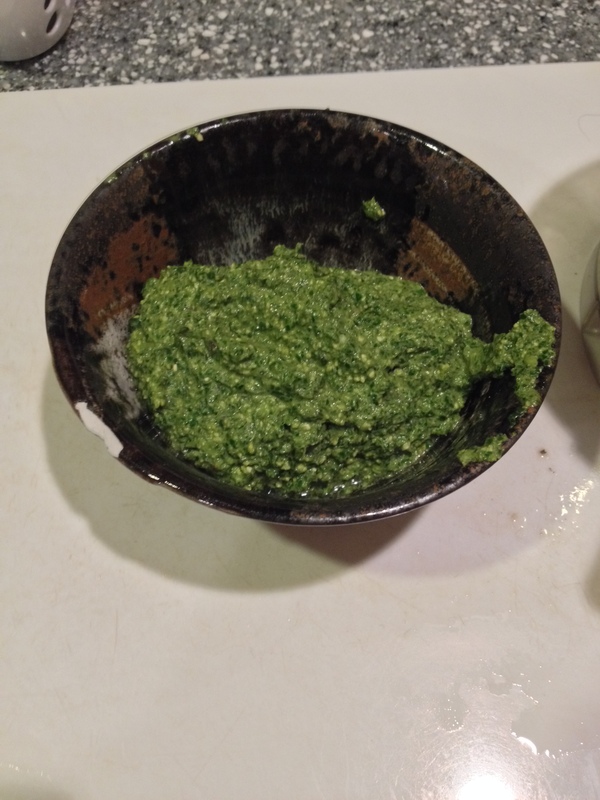 Set aside, in a bowl, but leave some of the remnants of the pesto in the food processor for the next step. Make the ricotta by adding all the ingredients into the food processor and blend until smooth. Scrape down the sides with the rubber spatular once or twice to get everything together. Grease a 9 x 13” pan with cooking spray. Lay out three dry lasagna noodles (or more if you could not find the no-boil type after boiling them, of course) on the bottom of the pan. Spread 2/3 cup of the sauce on top. 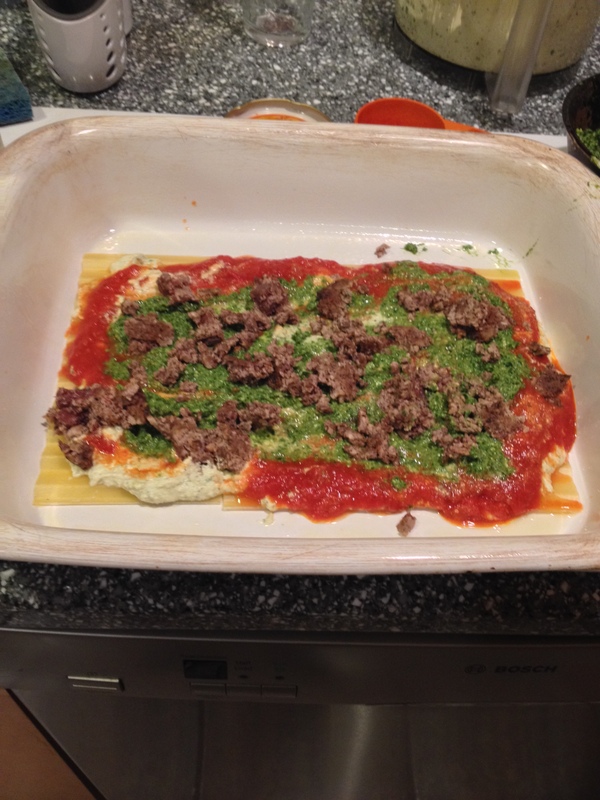 Spread 1/3 of the ricotta and pesto on top. Crumble and sprinkle 1/2 the batch of the walnut meat on top with your hands. 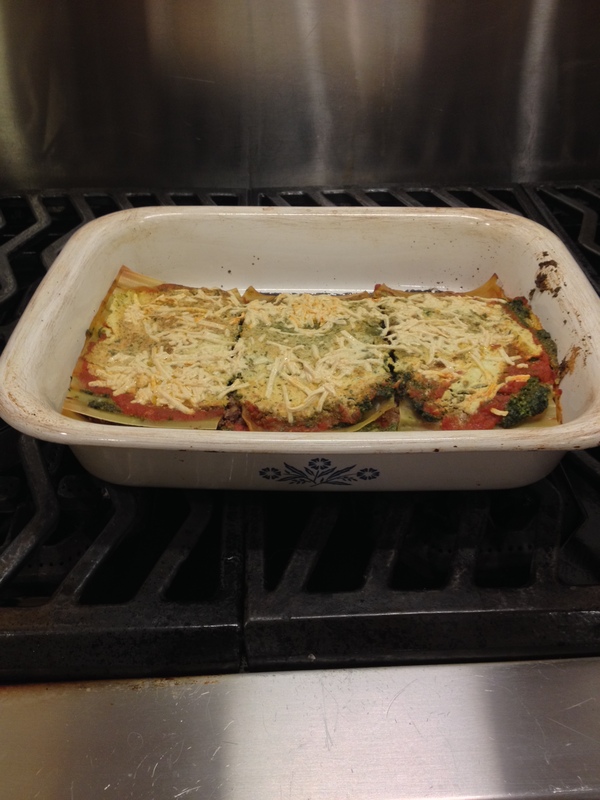 Place another layer of dry lasagna noodles on top and repeat steps 12-14. Sprinkle 1/3 cup daiya mozzarella on top. Bake in the oven for 35 minutes. 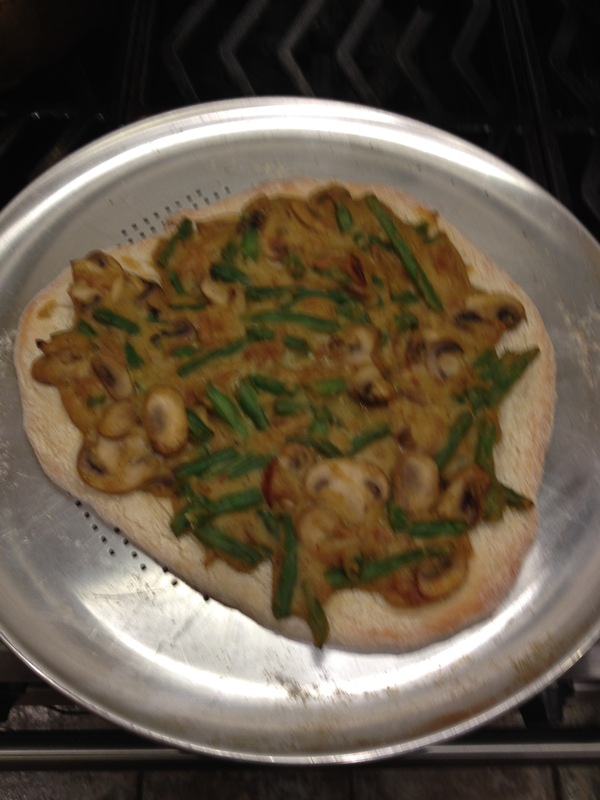 Let sit 10 minutes after taking out of the oven, and enjoy. 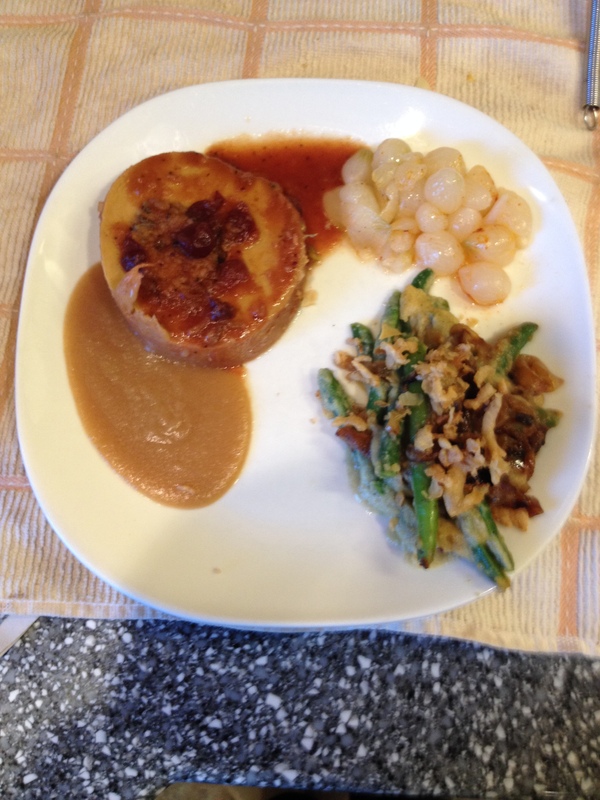 Foodie (Photo) Friday, Thanksgiving Edition! I’m still kind of super tired, I guess my cold is not totally gone and it’s upsetting to me a bit. So I apologize, but I’m going to try to get through posting this fairly quickly so I can go to bed early, haha. This was one of my better Vegan Thanksgivings though. 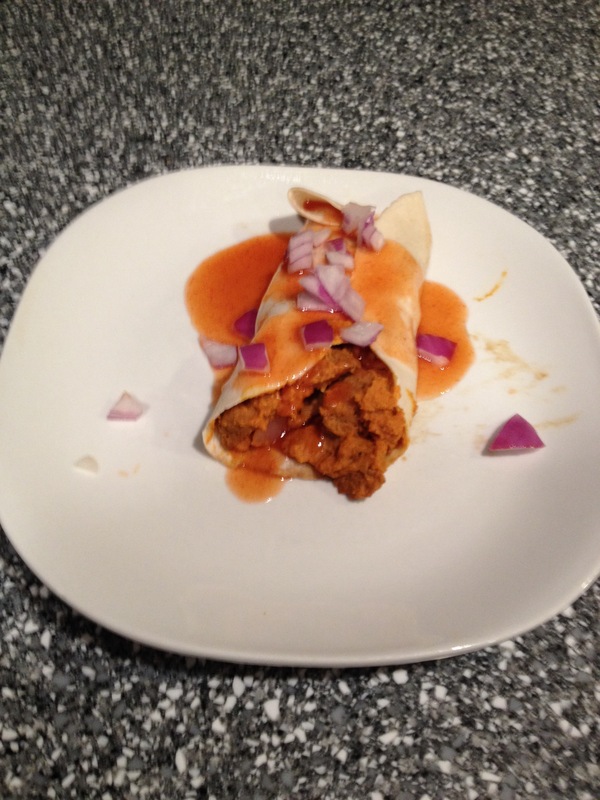 I ended up making a Tofurky roast feast in the crockpot with this recipe. I also cooked up the gravy that came with it. My grandmother brought some jarred pearl onions and we cooked them with some pepper, paprika and earth balance. I don’t know why, but I always liked that, it’s simple and really good. 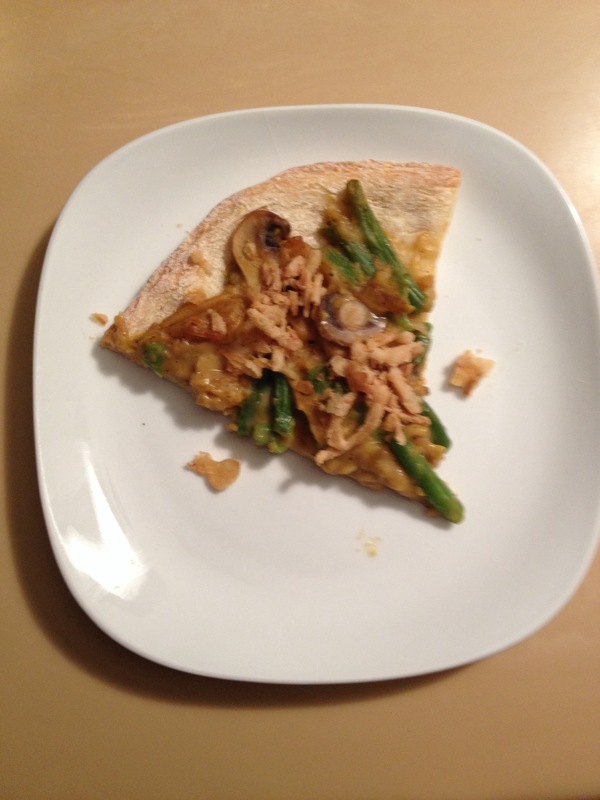 Probably the most elaborate thing I made, besides the pumpkin pie I ended up making, was the green bean casserole. It was well worth it though, it was quite tasty. Actually, I had been worried about it because I thought it might taste too parsnip-y, but it balanced really well. I only put 1/2 tsp salt in it total, though, and it was fine. The recipe calls for 1 1/2 tsp! No way. I’ll definitely be making it next year, though (well, if I decide to make a green bean casserole…and other factors…heh). 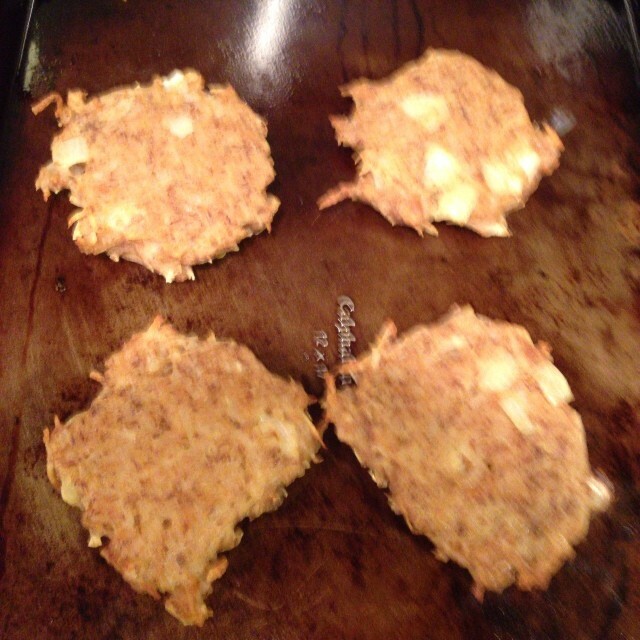 Additionally, I made potato latkes for Thanksgivukkah. I also made Baba Ganoush for an appetizer. I don’t think I can link the recipe to it though, I found the recipe that I had printed out awhile ago and have no idea where I got it from now. But it’s quite tasty. You roast 2 eggplants with some garlic (you put the garlic on it halfway through cooking the eggplants). Then you use the roasted garlic, sesame seeds, sunflower seeds, olive oil, salt, etc and make a paste in a food processor, then add the eggplant and combine. Pumpkin Echiladas from the Vegan Stoner Cookbook, and Green Bean Casserole Pizza from Bake and Destroy. I hope you all had a very Happy Thanksgiving, or Thanksgivukkah (Hanukkah…although it’s still happening…) if that’s your thing too. 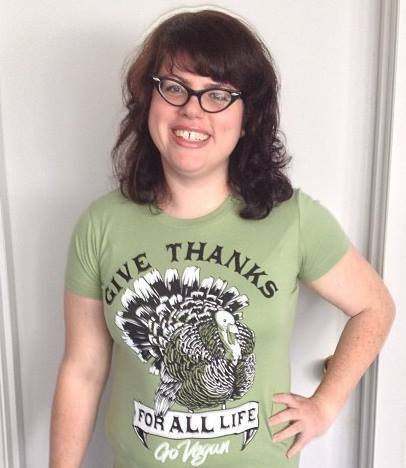 I was very glad to have a cruelty free and vegan Thanksgiving for myself once again, so I’m going to leave you this picture of me in my majestic Compassion Company Thanskgiving t-shirt. My “Thanksgivukkah” Menu- a bit early but at least I’m prepared! Anyways, my family has some traditions around holiday time that are difficult to break, despite being a vegan and/or not really being into the actual holidays themselves. One is that we try to have Potato latkes the first night of Hanukkah. But since everyone ends up eating a lot on Thanksgiving, and we’ll be doing tons of cooking on the first night in preparation for Thanksgiving, it kind of makes more sense to have potato latkes with Thanksgiving food. Someone on my facebook called it Thanksgivukkah, and I thought that was funny, so I decided to call this post that. I end up making a lot of separate foods that I make for myself and feast off of for the rest of the week, since my family is not vegan along with me sadly. So for the past three years I have been making my own Thanksigiving menu that people can eat from if they want to, or not. 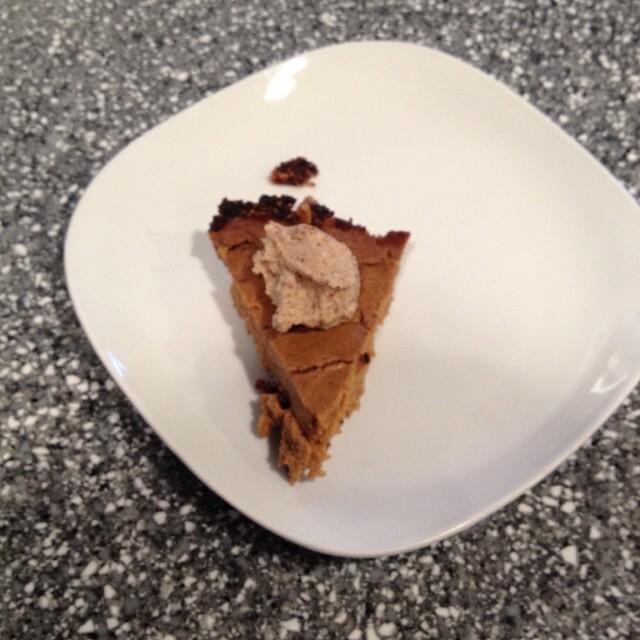 *edit* I was going to make some pumpkin pie squares but ended up choosing to make the Eat To Live Cookbook’s pumpkin pie because it seemed like a healthier choice–Eat To Live Cookbook is my newest (and healthiest) cookbook I own. Look out for my reviews of these recipes, hopefully on Thanksgiving day or the day after! Let me know if you decide to make any of these as well, and then let me know what you thought! Enter your email address to follow Banana Curl, Vegan Girl and receive notifications of new posts by email. Vegan MoFo 2017 Day 29: My birthday!